If you love the combination of fresh juicy cherries mixed with sweet pears...you will love this mixed fruit combination. My husband is a HUGE cherry fan and I am a HUGE pear fan. By combining the cherries and pears together...we both get what we want! Note: I don't use Fruit Fresh when making this recipe because I found that it wasn't needed to keep my pear chunks/slices looking white. However, feel free to use it if you want. Prep: Wash fruit under cold running water, drain. Peel fruit and remove pits and/or seeds. Cut fruit into 1/2" chunks except for the cherries. I found it best to use a de-pitter tool when de-pitting the cherries. 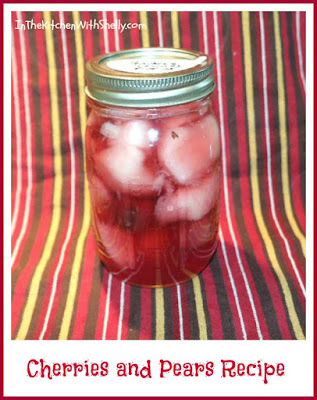 It makes quick work and keeps the cherries totally intact. Cook: Prepare syrup (recipe below) in a large saucepan and bring to a full boil over medium to high heat. Cook fruit in syrup just until all of the fruit is hot. Fill: Pack the hot fruit into a hot canning jar and ladle hot syrup on top...leaving 1/2" headspace at the top. Clean jar rims, add the seal and band until it's finger-tip tight. Place jar on elevated rack over simmering water in your boiling water bath canner. Repeat until all jars are filled. Process: Lower rack into simmering water. Turn up the heat and bring water to a full boil. Make sure water covers the top of your jars by at least 1". Process your jars in boiling water (pint jars for 20 minutes and quart jars for 25 minutes). Turn off the heat and let the jars sit in the hot water for an additional 5 minutes. Remove them from the canner and let them cool. In a few hours double check all seals to make sure they sealed properly. In a large saucepan combine together 5 3/4 cups of water and 1 1/2 cups granulated sugar. Heat over medium heat until all of the sugar has dissolved. Keep the syrup hot (on a low temperature) until you are ready to use it. Print Recipe: You can print out this recipe by clicking on the SHARE button located at the bottom of this post. A new window will open. Click on PRINT and the recipe will load into the window for fast printing. Enjoy! This is another good canning recipe that I will use someday. cherries are one of the few fruits which I will eat in any form: candied, dried fresh,canned,etc!